Welcome to The Hope Group. Our goal is to provide excellent service in the field of suicide prevention, intervention and postvention peer support in the Denver metro area. We welcome your feedback and want to know how we can continue to improve in doing so. Please email us your suggestions at info@hope-group.org. Visit our Support Groups page for a current schedule and for more information about the groups we currently have available, including groups to support suicide loss survivors (Southwest Metro Denver Survivors of Suicide, and Teens Overcoming Grief After Suicide), suicide attempt survivors (Surviving, Striving and Thriving, and Teens Surviving, Striving and Thriving) and families of individuals with ongoing suicidal ideation (suicidal thoughts), a chronic mental health condition or individuals who have survived a suicide attempt (Group 4F – Fortifying Families and Forming Friendships). Please visit our Workshops page for information about our available suicide survivor support classes and 7-week workshops. 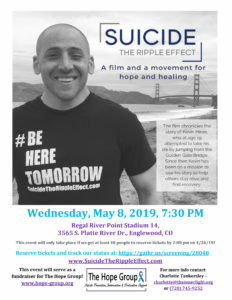 Please visit our training site www.denverqprtraining.com for more information about our about our Suicide Intervention Skills Gatekeeper Training Workshop. All calls are returned within 1 business day. If you or someone you know is feeling suicidal or is in crisis: please contact Colorado Crisis Services at 844-493-TALK (8255) or text TALK to 38255. You can also reach them at www.coloradocrisisservices.org. You can also call the National Suicide Prevention Lifeline at 800-273-TALK (8255), reach the Crisis Text Line by texting HOPE to 741-741 or visit www.imalive.org for online text chat. Don’t give up fighting, please reach out. Hope and help are available 24/7/365.